The first finals of the Cycle I in the AIBA Pro Boxing were held in two locations and following these contests the Asian continent can celebrate two titles. Chinaâ€™s top boxers Lu Bin (49 kg) and Zhang Jiawei (56 kg) defeated their rivals in the APB World Championship Matches and received their belts. Six Asian boxers fought out their places in the finals of the APB World Championship Matches and all of them could qualify to the Rio 2016 Olympic Games. Three are titleholders among our six athletes in the AIBA Pro Boxing while the Asian titles are guaranteed at the Light Flyweight class (49 kg) and at the Lightweight class (60 kg) and has got chance to win two further categories in the APB World Championship Matches. Chinaâ€™s Lu Bin had to meet with another Asian boxer in the final of the APB World Championship Matches at the Guizhou Arena in Guiyang. Lu Bin is the youngest Asian boxer in the AIBA Pro Boxing while his Asian opponent Kazakhstanâ€™s defending AIBA World Champion Birzhan Zhakipov is already a veteran who was involved to their national squad still back in 2005. Their Light Flyweight class (49 kg) bout was unanimous decision to Lu Bin who could defend his throne in the AIBA Pro Boxing. Zhang Jiawei won the Cycle I and qualified to the Rio 2016 Olympic Games as second Chinese boxer. The Bantamweight class (56 kg) boxer has done an incredible job in the Foshan Nanhai Gymnasium where he had to meet with Franceâ€™s titleholder Khedafi Djelkhir who returned to the AIBA boxing from the professional world. 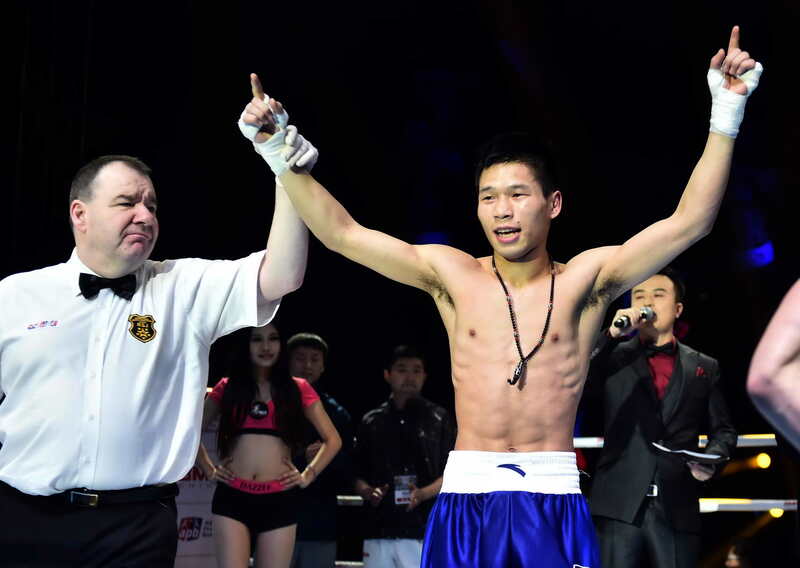 Zhang Jiawei had a 12 rounds fight against the top European opponent and he was able to win the manly contest by unanimous decision. Kazakhstanâ€™s Berik Abdrakhmanov defeated for the title Uzbekistanâ€™s Beijing 2008 Olympian Hurshid Tojibayev in January while their re-match for the APB World Championship Matches will be coming soon at the Lightweight class (60 kg) which guaranteed Asiaâ€™s third triumph in the professional league. Iranâ€™s London 2012 Olympic Games quarter-finalist Ehsan Rouzbahani shocked all of his rivals in the previous rounds and also have got chance to defend his throne at the Light Heavyweight class (81 kg).